God is in charge of this economy? Home / engaging / God is in charge of this economy? I have always been suspicious that this was true. If you follow out the way that folks talk about an interventionist God who meddles, tinkers, intervenes and interacts with ‘His’ (always his) creation … then it has to follow that some within that stream will think that God actually runs the economy. I have met people who think this. I have reported it and based some of my posts on it – only to have it be consistently rebuffed as a case a few superstitious, uniformed or immature people or groups. Then, last week this article by Paul Froese came out in Religion & Politics called “How Your View of God Shapes your View of the Economy” . It turns out that it is worse than I even thought! People who look at data and conduct surveys and polls are always looking for variables. One of the wrinkles that has gotten a lot of attention lately why some conservatives – mostly based on social concerns like abortion and gay marriage – vote against their own economic interest. Why do those who are not benefiting from the current economic structure continue to put forward policies and candidates who reinforce the status quo and hierarchy? 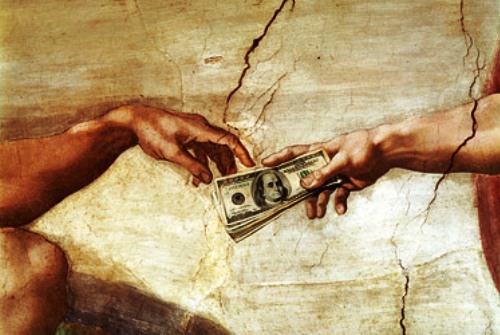 It turns out that even though Jesus says you can’t serve both God and mammon (whatever that is) but what if you didn’t have to make that distinction? What if within the protestant work ethic there was a mechanism by which God was in charge of the economy? To put this more concretely, approximately 31 percent of Americans, many of whom are white evangelical men, believe that God is steering the United States economy, thus fusing their religious and economic interests. These individuals believe in what I call an “Authoritative God.” An Authoritative God is thought to be actively engaged in daily activities and historical outcomes. For those with an Authoritative God, value concerns are synonymous with economic concerns because God has a guiding hand in both. Around two-thirds of believers in an Authoritative God conjoin their theology with free-market economics, creating a new religious-economic idealism. Nearly one-fifth of American voters hold this viewpoint, signaling that it can be a major political force. Does the willingness of God to fix the economy become dependent on us to deal with our social ills? In other words: does prosperity result from faithfulness? Believing in this Authoritative God, depending on where you live in the world can lead one to a socialist conclusion or a non-capitalist structure. Why in the US does it mean a unquestioned allegiance to a laissez-faire ideology? … the United States stands as a clear exception. Americans who feel that “God has a plan” for them and their country are much more likely to think that “success is achieved by ability rather than luck” and that “able-bodied people who are out of work should not receive unemployment checks.” And over half (54 percent) of Americans who think God controls the economy feel that “anything is possible for those who work hard”; in contrast, only one-quarter of Americans who rely on human resourcefulness, rather than God’s plan, feel this way. Perhaps it is the fervent individualism of American Christianity which makes free market capitalism seem like a Divine mandate. Because evangelicals assert that you alone are responsible for your eternal salvation, it makes sense that the individual is also responsible for his or her economic salvation without government assistance, especially if God is the only assistance you really need. I am fascinated by this. I have written (and talked on TNT) so often about the implication of this type of evangelical-charismatic-protestant mentality that believes in personal piety (small) and super-structure cosmic spiritual warfare (large) but has no framework for (linking middle) ‘powers the be’ in systems, structures, and institutions. If God magically made the world in 6 days, made the Sun stand still, can time earthquakes to get Apostles out of jail and one day will pull back the clouds and ride into to dole out justice and end the whole bloody thing… I guess it makes sense that God is guiding the economy. This is why I am so passionate about a better way to read the Bible – we need a mature hermeneutic that see the text with its eyes wide open, aware of the world as it is not just the way we want it to be or we used to think it was. I might need to apologize for my sassy tone here – but I truly am interested in you thoughts. Don’t get distracted by my style, I want to hear what you think about the subject! What say you?